Over the last ten years there have been several intelligent books on past conductors from American University publishers, including biographical studies of Fritz Reiner and Bruno Walter. With that in mind I looked forward to reading this book on the �virtuoso� conductor. The term �virtuoso�, in the etymological sense, has a long, and rather confusing history; for Aristotle it simply meant a kind of practical wisdom, or good will; for Machiavelli it meant a more tactical deployment of ethical know-how. But from the early 19th Century, in musical terms, with figures like Liszt and Paganini, �virtuoso� became more a connotation for displays of compositional, and more specifically, performance brilliance, which however did not necessarily militate against musical integrity and sincerity. Holden does not categorically define what he means by �virtuoso�, but he does, in the preface, stake-out his criteria and parameters for the �virtuoso conductors� he discusses. This is in terms of belonging to a particularly European heritage, and tradition, having continuing artistic, cultural connections to that tradition, which Holden sees in general terms as emanating from the example of Richard Wagner. From this preface I noticed a slippage between what Holden defines as �European�, and �Central European�. From �Central European�, in the geographical, and Habsburg sense, I would have read as encompassing Czechoslovakia, Hungary, Romania, Poland among other territories. And from the more general term European I would, in the geographical, cultural and musical sense, have included France, and at least the Netherlands! But then, Holden tells us, his preferred �virtuoso conductors� must have spent the �greater part� of their career in �German-speaking� countries, which here are basically confined to Germany and Austria, particularly the cultural centres such as; Vienna, Berlin, Leipzig and Munich. Indeed all of Holden�s ten chosen examples came either from Austria or Germany, with the exception of Arthur Nikisch who, although born in Hungary, from an early period in his career operated in German and Austrian centres, and spoke predominantly German. 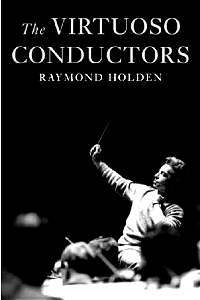 So, from Holden�s perspective, important virtuoso conductors like: Habeneck, Berlioz, Lamoureux, Pasdeloup, Monteux, Désormière, in France alone, are either not mentioned, or relegated to marginal status. Willem Mengelberg (seen by Richard Strauss, and Mahler as the quintessential virtuoso conductor) is mentioned in peripheral, footnote terms a couple of times! And is not Italy part of Europe? Arturo Toscanini, who literally defined virtuoso conducting, orchestral performance and opera production in the late 19th and early 20th Centuries, is relegated to about a half a dozen citations, mostly marginally or in contradistinction (negatively) to conductors like Furtwängler. Important Czechs like Sejna, Talich and Ancerl are not mentioned. Also not mentioned, or marginalised, are Hungarians like Fritz Reiner - seen by many as the ultimate virtuoso conductor whose only equal was Toscanini - George Szell, Antal Dorati, Ferenc Fricsay, among others. But even in Holden�s rather limited Germano-centric parameters I simply can�t understand why conductors like Erich Kleiber, or Fritz Busch are excluded, or placed at the periphery. By 1923 Kleiber was general music director at the Berlin State Opera - a more prestigious post than either those of Walter (Charlottenberg) and Klemperer (Kroll). There he gave such important premieres as �Jenufa� and �Wozzeck�. Kleiber also conducted regularly the Berlin Philharmonic and, as a native Viennese, the Vienna Philharmonic, up until the time of his death in 1956. Here, it could be argued Kleiber fulfils all of Holden�s rather arbitrary criteria, a conductor who �wielded considerable artistic power�, not just a �jobbing conductor�, more completely than say Furtwängler who, as Holden concedes, was not a particularly �natural� opera conductor, in the same sense that Kleiber was. One only has to compare Furtwängler�s characterful but unrefined heavy conducting in �Figaro�, with Kleiber�s wonderfully agile, elegant conducting of the work in his famous Vienna (1954) recording. Kleiber, although not Jewish, left Germany for South and North America in 1935 in protest at the Nazi regime, only to return to Europe after Hitler�s defeat. Similarly Fritz Busch regularly conducted the main German orchestras and was music director for over ten years at the Dresden Opera (giving important premieres of operas by Richard Strauss, Busoni, and Hindemith) before also leaving Germany in disgust at the crude racial violence of the Nazi regime. But the main point is that both these conductors would qualify equally, if not more, than some of Holden�s chosen examples, as prime virtuoso conductors, and in the wider meaning of that term. It also seems strange that Holden, who places particular importance on the range of modern, or contemporary music performed by the conductors he discusses, does not so much as mention Hans Rosbaud. More than all the conductors considered Rosbaud consistently championed the modern, the avant-garde. Rosbaud, up to his death in 1962, was programming the music of young composers like Stockhausen, Boulez, Xenakis, Zimmermann, Nono, Ligeti, Petrassi, Berio and many others. And Rosbaud was no �jobbing conductor� holding important positions at Munich, Frankfurt, Mainz, Donaueschingen, Aix-en-Provence and Baden-Baden. I am not sure what Holden means by �wielding considerable artistic power�? If artistic power can be measured in terms of lasting influence through almost unprecedented development of conductorial skills in the performance of new music and it�s technical challenges then Rosbaud certainly surpasses most of Holden�s elite maestros. Holden uses Wagner�s example (�a giant figure�) as the model for the development of the conducting tradition exemplified by his chosen �virtuoso� conductors. Although Wagner�s enormous influence on conducting is undeniable its direct influence is more discernable in three of Holden�s nine examples: Von Bülow, Nikisch, and Furtwängler. And even here, with Nikisch there is a rhythmic flamboyance, noted by many, in his conducting, which is not particularly Wagnerian. Other conductors Holden discusses, like Weingartner, Richard Strauss, Klemperer and Karajan, all, in their different ways, considerably departed from the Wagner paradigm of �melos� rhetorical gesture and flexible tempi. Weingartner�s famous Beethoven interpretations, in their classical objectivity and lack of subjective �interpretation�, were seen in their day as more akin to Toscanini�s approach. The chapters on Von Bülow, Mahler, Richard Strauss, Bruno Walter, Otto Klemperer, Wilhelm Furtwängler and Herbert Von Karajan are all adequate in terms of factual exposition, but I didn�t have the sense of Holden shedding any particularly new light on any of these figures. All have been comprehensively discussed and analysed far more thoroughly elsewhere particularly, in the case of Mahler, the massive study by La Grange. Also there does not seem to be a consensus, from those who were present at Mahler performances, on the nature of his conducting/interpretation; this is not discussed by Holden. The chapters on Nikisch and Weingartner come over as more interesting, partly due to the relative lack of information, at least compared with the above-mentioned examples, on these two important figures. We learn that Nikisch, at the Gewandhaus in Leipzig, championed new music by Mahler, Reger, Pfitzner, Busoni, Korngold and Schoenberg. Similarly the chapter on Weingartner emphasises his wide range of sympathies in opera; �Les Huguenots� and �La Juive�, Berlioz �L�Enfance du Christ�, �La Damnation de Faust�, �Roméo et Juliette�, and new music by the likes of Stravinsky, Debussy, Korngold and Schreker. The chapter on Klemperer is entitled; �A Troubled Mind: Otto Klemperer�. But apart from simply regurgitating the rather out-dated (in psychological, psychoanalytic terms) �manic� and �depressive phases� of Klemperer�s mental disposition Holden does not reveal much more than is already known, from Peter Heyworth and Klemperer�s daughter Lotte, about Klemperer�s �troubled mind�. As in other parts of the book there are many minor inaccuracies, mostly concerning dates and repertoire detail. Holden states that �between 1959 and 1964� Klemperer, at the Royal Festival Hall with the Philharmonia, only performed Bruckner�s last three symphonies. I am not sure why Holden can only take us up to 1964 here (Klemperer conducted there until 1971). Klemperer certainly conducted the 4th symphony of Bruckner there in the late �fifties. The fact that Klemperer visited and conducted in Leningrad and Moscow in the �twenties, and was at one point contemplating staying in Russia is not mentioned. This is a puzzling omission as Klemperer met Shostakovich in Moscow and was contemplating performing the premiere of that composer�s massive fourth symphony. The fact that he eventually did not perform the work hardly detracts from the importance of the meeting. Holden, throughout the book, makes hardly any reference to the political context of the periods discussed and the way that it affected the lives and careers of the conductors who were active in the Nazi period. Holden observes that Klemperer, in his comment on Richard Strauss�s �Metamorphosen� as �basically quite nice� was being �curiously facile� about a work of �deep emotional intensity�. Here Holden seems curiously blind to the way Klemperer, a Jewish musician, viewed Strauss, particularly the latter�s controversial relationship with the Nazi regime and his collaboration with many of their brutal policies; all meticulously documented in books like Matthew Boyden�s �Richard Strauss� 1999. I am not sure what �deep emotional intensity� means, but surely Klemperer�s coolness in relation to this work and its composer is due in some part to Strauss�s silence on the regime�s crimes towards European Jewry and others and its �In memoriam� heading which for Strauss meant the allied destruction of his beloved German Opera houses etc. A case of monumental insensitivity from the composer of Der Rosenkavalier. The chapter on Furtwängler is entitled: �Transcendental Furtwängler�. But Holden singularly fails to elucidate the nature of Furtwängler�s �transcendental� qualities, apart from a remark that he brought �fresh insights to every performance�, which could well apply to all the conductors he discusses. But transcendental in what sense? Transcendental of his historical context? Or in the Kantian analytic sense of the �unity of apperception�? Why does Holden incorporate the notion of the transcendental and not explain it, follow it through? It is amazing how Holden can elide the, for me, crucial questions of political, particularly Nazi influence, in connection with the conductors he considers. I have already made reference to the Nazi involvement of Richard Strauss: Holden seems to think that a letter Strauss sent to Stefan Zweig in 1935, where he distances himself from the Party, is enough to sort the issue out! Similarly with Furtwängler Holden seems to think his obvious compromising of his position by conducting at Hitler�s birthday can be explained away by his �resistance� to the regime. The details of Furtwängler�s resistance here are not included.. In a book that discusses both the careers of Bruno Walter and Furtwängler I would have expected excerpts from Walter�s 1949 correspondence with Furtwängler where he strongly criticises the latter for a total compromising of his art and humanity in the service of the �Regime of the Devil�. Holden concludes with a consideration of Herbert Von Karajan. Again I could discern absolutely nothing new here. And again the complex issue of Karajan�s Nazi links are here simply skipped-over as another biographical sequence. For Holden Karajan�s own self-justification that he joined the Nazi party as a career move seems to be enough. Although the full details of Karajan�s involvement are still not known, the 1990 study of the conductor by Robert C Bachmann deals with issue far more critically, demonstrating Karajan�s complicity in the selectivity of crucial documentary material. Despite some excellent biographical studies of important conductors recently, we still need a comprehensive study of the profession, its history, genres, styles, recordings, the de-mystification of some of the myths, the influences, or not, of older traditions on contemporary conductor trends and the future of the profession. Although Holden�s book attempts to evaluate issues and answer some of these questions it does so in a way which is too restricted, too selective, too standardised to meet the complex, critical themes and questions the subject demands.